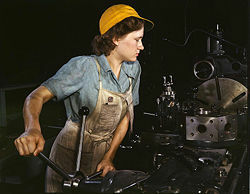 A factory worker in the 1940s in Fort Worth, Texas. A factory (previously manufactory) or manufacturing plant is an industrial building where workers use machines to manufacture goods or process one product into another. Most modern factories have large warehouses or warehouse-like facilities that contain heavy equipment used for assembly line production. Factories are a hallmark of industrialized society. They have changed the way many people live and work. On the one hand, they have been producing an increasingly wide variety of goods at relatively high efficiency and low cost, raising the living standards of large numbers of people in industrialized nations. On the other hand, they have also been places where workers have toiled under exploitative conditions, particularly during what has been called the Industrial Revolution. Although reform movements began to address these problems during the late nineteenth and early twentieth centuries, the ugly side of industrialization continued until the mid-twentieth century. Many have believed that ancient China was the first to create factories. In ancient China, imperial and private workshops, mills, and small manufactories had been employed since the Eastern Zhou Dynasty (771-221 B.C.E. ), as noted in the historical text of the Zhou Li. During the medieval Song Dynasty (960-1279 C.E. ), independent and government-sponsored industries were developed to meet the needs of a growing population that had reached over 100 million. For example, for the printing of paper money alone, the Song court established several government-run factories in the cities of Huizhou, Chengdu, Hangzhou, and Anqi. The size of the workforce employed in these paper money factories was quite large, as it was recorded in 1175 C.E. that the factory at Hangzhou alone employed more than a thousand workers a day. The Chinese iron industry was also expanded during the Song Dynasty, with a six-fold increase in per capita cast iron output between the years 806 and 1078 C.E., meaning an overall weight of 127,000,000 kg (125,000 t) of cast iron product from state-run facilities was forged in the latter year alone. Although large mills and manufactories were established in ancient Rome, the Venice Arsenal provides one of the first examples of a factory in the modern sense of the word. Founded in 1104 in Venice, Italy, several hundred years before the Industrial Revolution, it mass-produced ships on assembly lines using manufactured parts. The Venice Arsenal apparently produced nearly one ship every day and, at its height, employed 16,000 people. Many historians regard Matthew Boulton's Soho Manufactory (established in 1761, in Birmingham) as the first modern factory. Other claims have been made for John Lombe's silk mill in Derby, in 1721, or Richard Arkwright's Cromford Mill, in 1771—purpose built to fit the equipment it held and taking the material through the various manufacturing processes. One historian, Jack Weatherford, contends that the first factory was in Potosí, for processing silver ingot slugs into coins, because there was so much silver being mined close by. In the late eighteenth century, British colonies built factories simply as buildings where a large number of workers gathered to perform hand labor, usually in textile production. This proved more efficient—for administration and for the distribution of raw materials to individual workers—than earlier methods of manufacturing such as cottage industries or the putting-out system. Cotton mills used inventions such as the steam engine and the power loom to pioneer the industrial factory of the nineteenth century, where precision machine tools and replaceable parts allowed greater efficiency and less waste. Between 1820 and 1850, the non-mechanized factories supplanted the traditional artisanal shops as the predominant form of manufacturing institution. Although the theory regarding why and how the non-mechanized factories gradually replaced the small artisan shops is still ambiguous, what is apparent is that the larger-scale factories enjoyed technological gains and advance in efficiency over the small artisan shops. In fact, the larger scale forms of factory establishments were more favorable and advantageous over the small artisan shops in terms of competition for survival. Henry Ford further revolutionized the factory concept in the early twentieth century, with the innovation of mass production. Highly specialized workers positioned alongside a series of rolling ramps would build up a product, such as (in Ford's case) an automobile. This concept dramatically decreased production costs for virtually all manufactured goods and brought about the age of consumerism. Advanced statistical methods of quality control. These methods were pioneered by the American mathematician William Edwards Deming, who was initially ignored by his home country. Quality control turned Japanese factories into world leaders in cost-effectiveness and production quality. Industrial robots on the factory floor, introduced in the late 1970s. These computer-controlled welding arms and grippers could perform simple tasks, such as attaching a car door quickly and flawlessly 24 hours a day. This, too, cut costs and improved speed. Some speculation regarding the future of the factory includes scenarios with rapid prototyping, nanotechnology, and orbital zero-gravity facilities. Before the advent of mass transportation, factories' needs for ever-greater concentrations of workers meant that they typically grew up in an urban setting or fostered their own urbanization. Industrial slums developed, and reinforced their own development through the interactions between factories, as when one factory's output or waste-product became the raw materials of another factory (preferably nearby). Canals and railways grew as factories spread, each clustering around sources of cheap energy, available materials, and/or mass markets. The exception proved the rule: Even Greenfield's factory sites such as Bournville, founded in a rural setting, developed its own housing and profited from convenient communications networks. Regulation curbed some of the worst excesses of industrialization's factory-based society, a series of Factory Acts leading the way in Britain. Trams, automobiles, and town planning encouraged the separate development ("apartheid") of industrial suburbs and residential suburbs, with workers commuting between them. Though factories dominated the Industrial Era, the growth in the service sector eventually began to dethrone them: the locus of work in general shifted to central-city office towers or to semi-rural campus-style establishments, and many factories stood deserted in local rust belts. The next blow to the traditional factories came from globalization. Manufacturing processes (or their logical successors, assembly plants) in the late twentieth century re-focussed in many instances on Special Economic Zones in developing countries or on maquiladoras just across the national boundaries of industrialized states. Further re-location to the least industrialized nations appears possible as the benefits of out-sourcing and the lessons of flexible location apply in the future. Much of management theory developed in response to the need to control factory processes. Assumptions on the hierarchies of unskilled, semi-skilled, and skilled workers and their supervisors and managers still linger on. However, an example of a more contemporary approach to work design applicable to manufacturing facilities can be found in Socio-Technical Systems (STS). ↑ City and Factory Life. Retrieved June 26, 2008. ↑ Anne S. Tsui, Claudia Bird Schoonhoven, Marshall W. Meyer, Chung-Ming Lau, and George T. Milkovich. March/April 2004. "Organization and Management in the Midst of Societal Transformation: The People's Republic of China," Organization Science, 15 (2): 133-144. ↑ 4.0 4.1 Needham, p. 48. ↑ Jack Weatherford. 1988. Indian Givers: How the Indians of the Americas Transformed the World. Random House Publishing Group. ISBN 0449904962. Groover, Mikell P. 2007. Fundamentals of Modern Manufacturing: Materials, Processes, and Systems, 3rd edition. Hoboken, NJ: J. Wiley & Sons. ISBN 978-0471744856. Hopp, Wallace. 2008. Factory Physics, 3rd edition. New York: Mcgraw-Hill Publishing. ISBN 978-0071232463. Needham, Joseph. 1986. Science and Civilization in China: Volume 5, Part 1. Taipei: Caves Books, Ltd. ISBN 0521086906. Rubrich, Larry, and Madelyn Watson. 2004. Implementing World Class Manufacturing: Includes Lean Enterprise: Business Manual. Fort Wayne, IN: WCM Associates. ISBN 0966290615. This page was last modified on 12 October 2013, at 15:33.